Erin Lawlor ’s paintings are composed of large brushstrokes that undulate in striated waves across the surfaces of her paintings. The strokes move fluidly; the forms are as natural as a waterfall or waves that move with the tide. Lawlor’s strokes have substance and presence created by the saturation of colour and density. Large brushstrokes steeped in paint are laid by the artist on a wet ground. The paintings are constructed with wet strokes; she paints wet into wet. Her brushstrokes mix with the painted ground on the canvas, giving an articulated movement to each stroke. 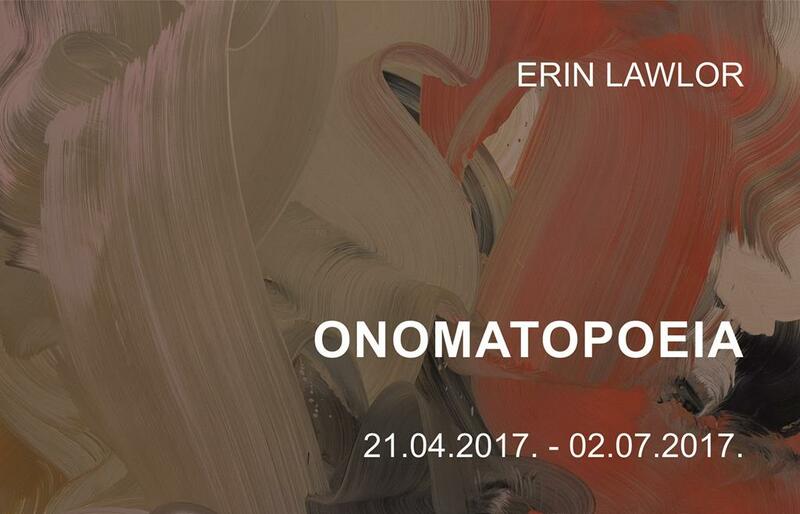 I watched Erin Lawlor ’s making these works when we shared a studio at the Rothko Centre in Daugavpils, Latvia. The primed solid colour canvases lie flat on the studio floor ready to be addressed by the artist. Lawlor mixes her oil paints and spirits in tubs, the paints are squished out of tubes in vast amounts. She uses her large brushes to combine the paint and then, with a gesture much like a dancer’s, her body bends over canvas, she allows her brush to create an undulating form that folds and unfolds as the stroke moves across the surface of the canvas. The action of making these works recalls action painting, not with the splashes and drips of the last century, but with the downward physicality of the artist delivering paint with her own body. The works call up many references to the history of art, but in particular the Baroque. The term baroque refers to irregularities in the shape of a pearl. Lawlor’s paintings are much like this – the beauty of a jewel made by nature is made even more beautiful by its asymmetrical composition. There is an undulating movement in these works; the energy is slow and creates a gentle fluidity. The paint is like smoke billowing in the air, caught for a moment before it disappears. Yet the paintings’ imperfections, made by the chance movement of the artist’s body and her relationship to the canvas, result in a break in the compositional space that adds to the movement in the paintings. Tiger tiger immediately refers to the poem by William Blake. The painting’s composition is circular, the movement takes the viewer around the canvas. The strokes of orange are bright and dominant in a curvilinear romp. Here Lawlor allows the underpainting to be revealed in the stroke. Each brushstroke has a different hue and contains a different level of painted ground. The literary reference is part of the artist’s palette of ideas; the titles are clues to her history and passion for poetry, popular culture, and music. Wild thing is composed in a palette of pink, cadmium red and acid yellow green. From the title one hears the next line, you make my heart sing. The painting does just that as it recalls the recent past of the 60’s London through its reference to The Troggs hit song of the same name. Lawlor is nostalgic; she is looking inward with her paintings and in doing so she calls up her internal state. Hiraeth is a work composed of layers of brushstrokes that fold, turn, and swish in a palette of crimson, umber, ochre and a blue that has the depth of colour of dark water. My eyes follow the brushstrokes as they move towards the centre. Hiraeth, whose meaning in Welsh is a longing for home with sadness, is a word that cannot be quite translated. Lawlor’s paintings, as they reveal themselves in their complications of stirred emotions, transcribe this state in paint. They express a longing for a place of the past that perhaps never existed. Grinches grinches the cat is a small work similar in sweep of stroke to tiger tiger. There are three large variegated brushstrokes that because of their scale can be read as shapes. Erin Lawlor manipulation of colour through the liquidity of each stroke and the change and nuance within is virtuosic. As Lawlor moves her strokes into the ground of the paint, she stirs up her own past and sentiments. The sweeping brushstrokes of Lawlor’s works take us all over the emotional map. She folds and unfolds the layers of the paintings like curtains that reveal her connections to loss, to love, to the past rising up into the present.